The Delta Group undertakes Project Management and Turnkey Construction activities for projects in the Power, Infrastructure, Industrial and Renewable Energy Sectors. Fabrication of C. W. Pipes From Plate (1600 Dia), Under Ground Coating and Installation. Material Supply for Complete Civil Work I.E Cement, Steel, Aggregate Side, Sheeting Material Etc. Supply of All the Civil Material, Water Pumps and All Electrical Auxiliary Material for Pre-stressing of Girders. Lifting and Shifting of the Girders. Design, engineering, supply, construction, erection, testing and commissioning of bridge super structure and associated electrical and instrumentation work. Turnkey engineering and construction of bridge super structure (525 mtr) and 20"/24" x 20 km twin pipeline. Civil Works, Erection and Commissioning Work of 2.5 MW Diesel Generator supply of all the materials for civil works. Supply of All Isometric and as Built Drawings. Erection and Commissioning Works of Diesel Generator. Transportation and unloading of gas turbine at site, erection, testing and commissioning of gas turbine with auxiliaries. Supply of construction equipment, manpower , consumables ,tools and tackles etc, project and construction management. Erection, testing and commissioning of turbine generators, auxiliaries , piping, c&i , electrical equipment fabrication and erection of steel structures at site. Supply of construction equipment, manpower including heavy rigging, tools and tackles etc. Erection, testing, commissioning 2 x 30 mw gas turbine generator. Erection, testing and commissioning of 1 unit of 125 tph heat recovery steam generator with its auxiliaries, stack, piping, insulation, refractory and painting work. Supply of all the construction equipment, manpower, consumables, ndt services, tools & tackles etc. Detailed engineering, supply, fabrication,erection, primer painting / galvanizing for complete structural steel for turbine building, coal silo building, pipe racks,service building, warehouse, switch yard , gratings etc. Detailed engineering and preparation of fabrication drawings. Supply of all the steel material including high strength bolts. Supply of construction equipments like cranes, automatic welding machines, manpower, tool & tackles, consumables etc. Supply and installation of under deck sheets. Supply, fabrication and erection of screens for pump house. Transportation, erection, testing and commissioning of steam turbine generator, critical hp piping, cw piping and auxiliaries Painting works for the power plant. 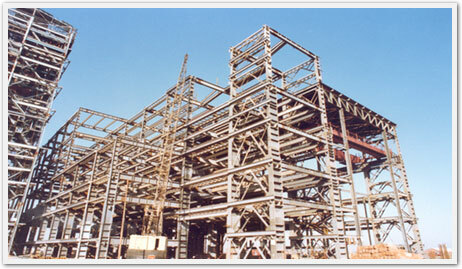 Erection of power house structures including pre-assembly, site handling and miscellaneous site fabrication work. Supply of construction equipment, manpower, consumables, tools and tackles. Electrical works including switch yard, instrumentation & control, assistance for pre-commissioning and commissioning. Complete detailed engineering and fabrication drawings for structural steel work. Complete civil works within the plant area including foundation building including finishing items, switch yard, gas booster station, control room etc. Complete structural steel fabrication and erection (rolled and built-up sections from plates), roofing and cladding work etc. Complete supply of civil materials like cement, aggregates, sand, bricks, doors and windows, flooring, glazing, paints, gratings, special colour coated and insulated roofing and cladding material, gratings, chequred plates etc. For the complete work. All construction equipments including automatic welding machines for steel built up sections, manpower, tool & tackles, and consumables. 6 units of 30 mw gas turbine and 3 units of steam turbine with associated facilities for combined cycle power plant at kathalguri, assam for m/s north eastern electric power corp.
Project was suspended due to financial closure not being met. Complete site levelling, boundary wall and foundation works completed before suspension. Demolition of tall and other structures including specialised technical back-up for cooling tower demolition by implosion method. Access road for the plant. All required government approvals for explosives. Controlled implosion of two cooling towers.